The translator function in the tool is fantastic, before we had to translate all the airports manually whereas now the tool does it for us! We LOVE this program. It makes our lives so much easier to convert flights to an itinerary! 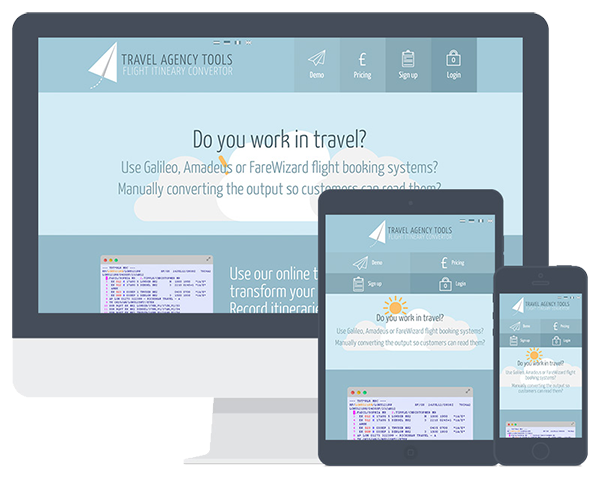 Travel Agency Tools takes the raw, hard to read, PNR (passenger name record) flights output of Amadeus, Galileo or Fare Wizard booking and reservation systems and turns it into a customer friendly table. The logo needed to be interesting and creative. The paper plane image immediately gives an idea of travel, with the opportunity to continue these design elements throughout the website and branding applications. Animations and parallax scrolling make the simple website dynamic. The content is easy to follow, with clear call to actions for how to download and use the tool. Interested in this style of work?